How will your cosmetic plastic surgery procedure be performed?. If you have been reading the Questions For Your Cosmetic Surgeon post sequentially, now you know the questions to ask about your Plastic Surgeon about their training and experience. The next topic is about the Cosmetic Plastic Surgery procedure itself. This post explores question three of the five questions you should always ask before having Elective Cosmetic Surgery – How will my procedure be performed? The Internet is a good place to get a general idea of what plastic surgery involves; however, there are variations on every theme. Variations are necessary for obtaining the best results. Some variations are driven by your anatomical needs, and others are driven by your surgeon’s experience. During your consultation, ask about the who, what, where, when, why and how of your procedure. After asking the first two Questions For Your Cosmetic Surgeon, you should have a good idea about your surgeons training and experience, but are they actually doing your surgery? Patients often ask me who is in the operating room. I am the one doing the surgery, but usually, there are four people in the operating room: me, an anesthesiologist, a scrub nurse/tech and a circulating nurse. My job is to perform your procedure and guide the rest of the team. The anesthesiologist is there for your comfort and safety. The scrub is garbed sterilely, and assists me with the procedure, while the circulating nurse helps everyone and can open additional items that may be needed for the operation. Some plastic surgeons will use a physician’s assistant (PA) or registered nurse (RN) as the first assistant during surgery. These are medical professionals who have received additional training, and they may do some of the suturing. In teaching institutions, interns and residents may be involved with your procedure. You should be informed before scheduling your procedure if someone other then your plastic surgeon is doing part of your procedure. Your surgeon is required to be present and provide supervision at all times. This may sound simple, and really it is. but there is nothing wrong with confirming what is planned. In fact, before every surgery, I take a “time-out” and review the particulars of your procedure with my team. Your name, procedure, allergies, medical conditions and status of prophylactic therapies (antibiotics, sequential compression devices and warming blanket) are reviewed, and everyone must be in agreement that everything is correct before surgery starts. Before surgery you should know what is being done; what is being fixed, how much it can be fixed and what cannot be fixed. The risks, benefits, procedure, alternative, recovery and limitations of your surgery should be reviewed as apart of your informed consent. If your surgeon is a member of the American Society for Aesthetic Plastic Surgery (ASAPS) or the American Society of Plastic Surgeons (ASPS), you can be certain that your procedure will be performed in an accredited surgical facility. This is a requirement of membership for these societies. If you cosmetic surgeon is not a member, be certain to ask about the facility in which you will be having surgery. When Can We Do Surgery? After a procedure is selected, scheduling your procedure at the appropriate time is important. Your surgeon will ask about your medical history, medications you take and other procedures you may have had. Be honest. Your answers to these question need to be accurate in order for you surgeon to provide you with the safest and most predictable experience. You will want to schedule your surgery at a time which allows for you to have the best experience and results. Fewer preoperative distractions allow you to concentrate on yourself and your results. The most common reasons for cancelling surgery are taking blood thinners, eating or getting a cold before surgery. Two of these three are completely preventable. For the best results, follow all your preoperative instructions. Post-operative care is equally important. Good support from friends and family help. It starts with them getting any last minute post-operative care instructions. You may not remember me visiting you in the post-anesthesia care unit, or the instructions the nurse may give you there, but your designated driver will. Having someone to help you, especially the first few days after surgery, is recommended. How much help you will need depends on the type of surgery you are having. Follow-up visits are important and should be considered when planning your surgery. Why Are You Choosing These Variations For Me? Options are good, but can also be a source of confusion. For example, there are several choices of breast implants; additionally, there may be multiple ways to the procedure, like with breast lifts and tummy tucks. I like talking about options. Usually, after a brief physical examination, the number of acceptable variations is significantly reduced, allowing us to focus on the approaches which are most likely to work best for you. Your plastic surgeon is there to guide you to the procedure which will provide the most improvement and the least risk. The Consultation Appointment: Consultation appointments are the time for planning your surgery. Selecting your procedure and planning how your procedure is going to be performed takes the most thought. It takes into account the answers to all the questions above. This is what consultation appointments are for. Your questions should be answered, and you should feel confident that the correct operation has been selected before going to the next step. If you are still confused, repeat the consultation appointment. The Pre-operative Appointment: Pre-op visits are for making your surgery predictable. Once the best procedure is selected, the remaining steps are much more linear. A pre-op visit is scheduled a week or two before your surgery date. The details of your procedure are reviewed again, consent forms are signed, pre-operative photos are taken and your preoperative instructions are given. To maximize the benefits of your pre-operative visit, you should be past the planning stage. If you have questions, write them down, so that they can be answered during your visit. The Day of Surgery: The day of surgery goes by quickly. You need to arrive one or two hours before you scheduled surgery time, depending on the surgical facility. There will be more paperwork. Your procedure and health will be confirmed. If anything has changed since your pre-op visit, be certain to let the staff and your surgeon know. An IV will be started for anesthesia and other needed medications. Once in the operating room (OR), you will be asked to breath oxygen through a mask, preoperative antibiotics and anesthesia are given through the IV, and the next thing you know, you surgery is completed. You will wake in the post-anesthesia care unit (PACU). If you are going home the same day, you will likely remain in the PACU for an hour, until you are fully awake. If your procedure is performed under local anesthesia with sedation, you will feel normal. If you have general anesthesia, you may nor remember everything that happens in the PACU, including my visit, but this is a normal effect of the anesthesia. For larger procedures, staying the night is common. Follow-up Visits: After care is equally important to good results. They are included in the cost of your surgery, because they are part of the procedure. Be certain to keep your appointments. Patients who disappear after surgery, are taking unnecessary risks. Medical tourism, while not uncommon, sells you short on follow-up care. Being near your surgeon, makes it easy to get care if problems arise after surgery. 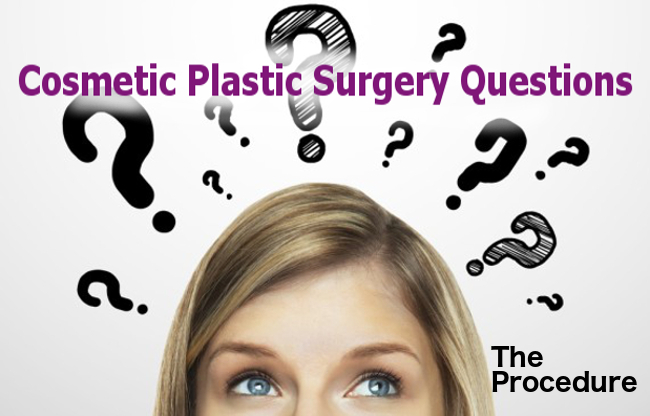 The fourth question to ask you Plastic Surgeon is about recovery. We will cover this in the next posting. In the mean time, if you would like to learn more about your options for Plastic Surgery, in person, give me a call at (925) 943-6353, and schedule a private consultation appointment at our SF Bay Area plastic surgery clinic.